"Didn't that movie used to have a war in it?" I once was a freshman at UCLA. I remember being anxious and excited moving into my dorm room, a dimly lit, cramped square of space with a view of the hallway of the building right next to mine. And it still feels like I can wake up five years ago, as if a long dream will end in time for me to attend my first day of classes. It's slightly depressing to think that already I'm done with my first quarter as a graduate student. It came and went much too fast, like a shooting star that disappeared before you could make a wish. This will be my last post of the quarter, of the year, and on this server. Remember, I'm moving. These past few weeks between entries haven't been awful exciting, but I figured I should post one last time to celebrate the end of finals, which were much harder than I anticipated. I thought that private schools, as well as graduate programs, were easier on the grading, and when combined together as a graduate program at a private school... I kinda thought they'd be passing out A's everywhere. In truth, I haven't gotten back my grades yet, but it sure feels like I got a thorough nine hours of stomping last week. Winter is here, it's always cold, and the trees are changing colors. The leaves fall down forming small circles of red, yellow, and orange. The Japanese Maples are particularly cool, although they are few and far between. Some more Stanford/UCLA comparisons. Currently, I don't have enough pictures to compare everything I want to, but here are two. This is a computer cluster in Y2E2, the equivalent of Boelter's SEASlab. It is smaller and generally less crowded, but the biggest difference is that only students in the civil department use it. There are a bunch of computer clusters spread throughout campus, making the system very decentralized and the complete opposite of the engineering mecca that was SEASlab. While the free printing at Stanford is nice, I miss the variety of people, the space, and the chaos that sometimes happened at UCLA's computer lab. You didn't get as much work done, but you had twice the fun. Also stereo equipment, just in case you have a vinyl in your backpack. And lastly, their DVD collection, where you can rent up to two movies a day for free. The collection is updated constantly with new releases which means it's basically a better Blockbuster. You can probably tell that I like the Green Library for all the wrong reasons. A few more pictures of campus. This shot was taken on the second story of the James Clark Center. Stanford has a thing for big, really green lawns and palm trees. As far as architecture goes, all the newest buildings follow a trend of white stone walls, cardinal red accents, and large blue-green tinted windows. The front building on the right that follows this aesthetic is the newly constructed Li Ka Shing Center for Learning and Knowledge. You'd think that on a university campus all the buildings would be for learning and knowledge, but apparently this is the only one. Whatever, the building looks so cool you really don't care what it's called. I hear it has a really good deli too. So long! In the coming weeks I will be busy transferring everything to the Stanford servers as well as tending to other things like going home and Christmas and stuff. May you all have a great Christmas and New Year! I think one of your resolutions should be to visit my site every single day and to tell all your friends about it. It's been a looooong time. How have you been? For me, the weeks just started blasting off after midterms, and before I know it I'm almost done with my first quarter at Stanford. Tomorrow (today) I go home for an awesome full week off for Thanksgiving break. I'm not bringing back my desktop so I figured I should post now unless I'm looking for a four week gap between my posts. Although it isn't up yet on the Stanford server, my site will soon be reached at http://www.stanford.edu/~bwada1/. Don't even try to hide it, I know you all want to bookmark my site. I hereby give you permission. Okay, I realize I mention football a lot. I'm not any sort of fanatic, and this will be the last post about it, I promise. It's just that Saturday happened to be the Cal vs. Stanford game, also known as The Big Game. After a very strange BART ride from Millbrae involving pee, traffic cones, and taxi cabs, we arrived at the Berkeley campus just in time to see the start of the game. At lunchtime I learned that you can get a 'jumbo' dog for $4.25 which is actually smaller than normal store bought weiners. ...and impaling a barely noticeable little bear at the top of a sculpture. As you can tell, everyone was going Mike Tyson ballistic about our longheld feud with our uptown rivals. In truth, just like UCLA vs. USC, the rivalry seems very one-sided. Berkeley haaaates us. We slaughtered them. At the half the score was 31 to 0, with the final ending up being 48 to 14. Not only was the game slightly boring (yet satisfying), it was absolutely freezing. After winning, a lot of people rushed the field, but since we were at the very top of the stadium we didn't even try. Although these guys are supposed to be my real rivals, nothing will ever be quite as exciting as the USC vs. Stanford game. While it was freezing at the stadium, to make matters worse it started pouring after the game. Thankfully, it wasn't during, or else I probably would have died. Walking ten minutes to the BART station was a horrendous experience which reminded me of Japan in the wintertime - cold, wet, and windy. Speaking of wins, last week was the 6th Annual College Cup for dragon boat racing, held at the Jack London Aquatic Center. Hi Daryl! I am proud to say that UCLA dominated the 500m mixed in A division. Good job guys, you all are doing what my team never could. Of course, we also never had mandatory gym workouts. Also awesome was seeing all the alumni come out and support. We rock. I'll end this post with a few more scenic shots of campus. I wanted to do more UCLA/Stanford comparisons, but I realized I don't have enough shots to do so. I haven't been taking too many pictures because the days recently have not been ones where I want to walk around and spend time outside. You know what, here's a comparison: when it comes to weather, UCLA is far superior to Stanford. At least in LA you can go outside at night. Stanford has a lot of trees and pretty buildings. These shots were taken from the top of Hoover Tower. Unlike UCLA, the campus is extremely flat. I found that I actually prefer the hills and slopes of UCLA, despite the niceness and cleanliness of Stanford. It just makes the campus more interesting, more fun for skateboarders, and you can also see things above or below you, and not just right in front of you. UCLA also wins in this respect. You can see some of the midrise towers in the very back where many of the graduate students are housed. A shot of the oval, probably the coolest and grandest entrance to a campus... ever. The main quad centered in the middle of campus. I would describe Stanford as huge and sprawling. With finals week coming up soon, who knows when I'll post again, and about what. It is quite possible that the next time I post just might be during a new quarter, and a new year. Time goes by faster than the wind, faster than the planes in the sky. Yesterday was already the one year anniversary of me leaving Japan, which means my blog is already over a year old. It might be a long time between posts, but it sure won't feel like it. "Is anyone missing a Casio fx-115 calculator? This is the same calculator I use (FE and PE exam approved) and I didn't notice until yesterday that I now have two of them. I'm guessing someone left if on my desk during office hours...or, my calculator had a baby." I lied. There were a few recreational things I was able to squeeze in, although they are pretty mild. And because I have another test on Monday that means I'll miss Halloween too. Dang. Last Friday I was able to attend an EV sponsored trip to the de Young museum which is currently holding a special exhibit showcasing pieces from famous artists such as Picasso, Van Gogh, and Cezanne. EV is short for Escondido Village, the huge graduate housing complex on the Stanford campus. This was my favorite painting in the special exhibit. 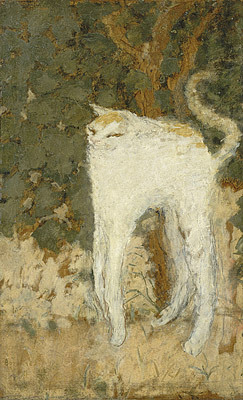 It's called The White Cat and it's by Pierre Bonnard. Most people predictably picked some of the pointillist paintings (bunch of dots) or Van Gogh's Starry Night (not the one you are thinking of, this was an identically titled, more obscure version). Perhaps I can't get my head around art, but to me 95% of paintings are always of ridiculously boring scenes like some random dude or fruits or people doing normal, everyday things. I liked The White Cat because it was the only one that made me laugh (ie, ellicit a reaction). Needless to say, I was more than slightly disappointed with the exhibit, and later on with the food as well. An important note - never buy food at the museum. For $15 you get a shot of soup, a few leaves of salad, and a single cube of short rib beef. It tasted good... for the two minutes I spent eating dinner. By the way, someone out there paid thousands of dollars for this. This wasn't something I did so much as took a short glance and left, but I thought it was worth mentioning. I should first explain about the Loyalty system here. Because of demand, in order to ensure tickets for the Cal vs. Stanford game, aka The Big Game, you have to attend sports events and earn "loyalty points." You need nine points to guarantee a ticket to the game. Saturday was the Washington State vs Stanford game, worth three points, which also happened to be our homecoming game. I had a ton of studying to do so all I did was scan my card to get in then leave, but before I did I saw what you see here: a bunch of smiling trees dancing on the field. There were five that I counted, but I'm assuming there was more. It seems that a lot of alumni were invited back to reprise their roles during the game, including cheerleaders and probably band members. I wish we had five trees all the time. Last, but not least, I've decided to reveal some pictures of the campus. I had this whole idea of making a huge UCLA/Stanford comparison post, but that's going to take a ton of work and is probably not practical. I'm thinking of doing this comparing thing in increments. The first thing I want to showcase is the engineering department, of which my year is the first to fully use. Compared to UCLA's engineering department, Stanford wins hands down. I think you can see why. The main building I use is called the Jerry Yang and Akiko Yamazaki Environment and Energy Building, commonly referred to as Y2E2. It was the first of the new engineering buildings to be erected, and is recognized to be extremely environmentally friendly and cool to look at. The building utilizes several "green" designs common in sustainable architecture such as a lot of windows for natural lighting during the day, low flow or waterless urinals, and big, open atriums for efficient air circulation and heat transfer. Contrary to UCLA, I'd say that engineering has the nicest part of campus. It's a really smooth ride for bikes, too. Sorry Ms. Jen Sun. It's close though. *edit* Jen-Hsun is actually the co-founder of Nvidia and actually took classes under then-professor-now-president John Hennessy. This is the James H. Clark Center. I think it's for med students, and while not part of the engineering complex, the architecture is in the same vein and is very cool to look at. Apparently, this particular building was designed by Norman Foster. *edit* I found out that this is the bioengineering building, but it seems like all the new buildings on campus are using the same architectural aesthetic. I think that's it for me. Expect more in the coming weeks. I'm assuming that since my last midterm is on Monday things will get slightly more lax afterward and I'll have some free time to think of new things for posts. In the meantime, if you are ever wondering what I'm doing at any given time, it's probably reading notes or arguing with people about plastic hinge formation. It's late and I'm tired, but updating this blog has really come down to a "now or never" situation. In fact, I've been wanting to post something since Saturday, but things have... gotten in the way. School is getting exponentially harder as the days pass by and I'm having a hard time keeping up. It also doesn't help that I have a tendency to do things like spend twenty minutes watching Conan O'Brien's Class of 2000 Harvard graduation speech. You can watch it here and here. Saturday was the Stanford vs. USC game in football and water polo as well, and we pwned them in both respects. This was, hands down, the most exciting game I've ever seen, and apparently everyone else felt the same way; USC is so hated at Stanford, that after the final field goal the students rushed the field. This is not a normal occurrence after a win, so I'm told. Final score was 37-35 Stanford. The score was going back and forth the whole game. We managed to run the entire field in about a minute and made our final kick in I think the last 4 seconds of the game. Like I said, best game ever. On a final note, I love our tree. He is probably the stupidest mascot in the history of anything, but he is also the only one that manages to elicit some sort of reaction when he's on the field. To me, he is a constant crack up, but nobody seems to understand that. On a final, final note, while it was an exciting game for Stanford, the same could not be said for UCLA. I didn't watch, only heard that they got clobbered by Cal. I think the worst part, however, is that I'm used to hearing things like this. Although UCLA winning would have made the day that much more perfect, if I had to choose between Cal and USC losing, it would have to be USC, and they did. What do USC fans talk about when they don't have their football? Maybe George Lucas. This is a serious question here. I don't know the answer. It has already been two weeks since my last post, not to mention the fact that I recently passed the month mark living here in Palo Alto. In that ridiculous way, I feel like I've been here forever, and yet I still can't believe how fast time has flown. I have a lot of things I want to write here on this blog, but that will have to be for another day. Hopefully I'll be able to write it up in a timely manner. Until then, it's late, I'm tired, I'm going to stop and go to sleep. Goodnight. So here we go once again. Hello everybody, I am a first year Stanford graduate student in the department of Structural Engineering and Geomechanics. I am pursuing a Masters of Science which I expect will take 1 year and 2 quarters to complete, meaning I'll be done around March 2012. I drove to Stanford from home on September 11, 2010, just barely arriving on 20 miles left in my tank and 15 minutes left until registration closed. Needless to say, I was freaking out on the drive up, but somehow I made it out alive. Okay, now what is this blog about, you might ask. My Japan blog was about my experiences in Japan, which I guess makes this Stanford blog about my experiences at Stanford. Don't worry, I won't bore you with my grand adventures in reinforced concrete or nonlinear structural analysis. I'm hoping to write about other things, perhaps a grand adventure I might have, general observations about campus life, and anything else that I find interesting and worth posting. Basically, I hope that this blog will be both entertaining and informative, a glimpse into the mysterious life of an engineering graduate student at Stanford, except not so much about the engineering, but the other stuff... Here we go! It's hard to imagine I arrived here 19 days ago. I'm already finishing up my second week of classes, having already done one quiz, homework assignment and turning in another tomorrow, which happens to be 29 pages long. You don't want to know. I've done so many things here already it's hard to structure my thoughts into a coherent narrative. Let's start from the top. The week before school starts is called Welcome Week and is put on by the New Graduate Student Orientation committee, or NGSO. It's a time for socializing, getting to know the campus, the people, and your respective program. Basically, it's a time to have all the fun you're not going to have during the normal school year. 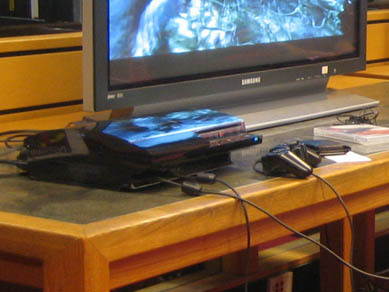 Events put on are numerous and include tours of the many libraries, Q&A with current students, staff, and faculty, activity fairs, and a ton of free food and booze. As I plan to explain in future posts, Stanford is a very wet campus. I think this is why tuition is so expensive. Class time already! Currently I am signed up for three classes, but I'm planning to sign up for an additional one unit fun course. Some of the courses I'm interested in include, but are not limited to, the golf class, horseback riding, French wine tasting, Spanish wine tasting, and beer tasting. Maybe they have an agriculture class as well, but let's not get too crazy here. As far as my actual SEG program schedule goes, this quarter I am taking Probabalistic Models in Civil Engineering (203), Advanced Structural Analysis (280), and Advanced Behavior and Design of Structural Concrete (285A). So far I am very impressed with the academics here. The professors are all really nice, understandable, organized, and obviously geniuses. They aren't arrogant, but they do expect a lot out of their students. I pray that I can keep up. Even though I'm writing this Thursday, the week is pretty much over for me. This week has basically been filled with homework. That 29 page assignment I mentioned earlier didn't just happen overnight. What I'm worried about is what subsequent homeworks will look like, and what the heck the midterms will cover. Fortunately, everyone in the Structural department is very friendly, willing to help, work in groups, and share everything they know. The engineering mentality I've come to love is that everyone is in it to suffer together, as opposed to the pre-med competitiveness of dog-eat-dog. So that's it for my first three weeks here. I'll try to keep posting on a weekly basis, but as the work piles up this might be unfeasible. Like my Japan blog, I aim to center my entries around themes, rather than a week-to-week discussion like I did here. Stay tuned for more! 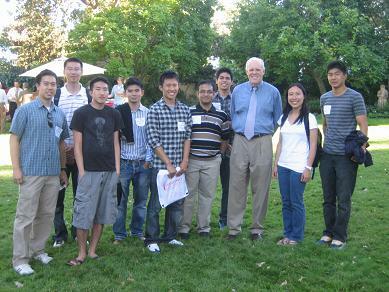 I'll end now with a a group of us posing with John L. Hennessy, current President of Stanford. We missed the last bus to get this picture, but I think it was worth it.